This Dog Sheep compatibility can work, but it will likely be very tricky to pull off. The Chinese animal sign Dog is a skittish sign, prone to emotional instability. They hold everyone up to an exceptionally high standard of behavior. They suffer from an irrational fear that no one else can be trusted. In the face of adversity, or when finding its beliefs challenged, the Dog man or woman can very easily become stubborn and unthinkingly dogmatic. The code will be adhered to even when shown to be inappropriate. Dogs do not tend toward idle banter, instead focusing on topics and subjects they find important. They can come across to others as exceedingly serious and waspish, as anyone who disagrees with them is most assuredly going to hear about it. The Chinese zodiac sign Sheep is artistic, esoteric, and eclectic. Trying to follow the logic of a Sheep or Goat, for anyone other than people of the same sign, can be quite frustrating. They do not so much think in straight lines as they do in intuitive leaps and sidesteps. The Sheep man and woman do enjoy time with and around others, but find the inside of their own head so fascinating that they’ll tend to get lost. The Dog and Sheep relationship can be blissful, if both of them make a little bit of effort. The Sheep represents the epitome of an Ivory Tower intellectual. They are perfectly happy chasing a thought all the way through to its conclusion, then finding another one to chase down. As Chinese zodiac compatibility predicts, the Chinese Dog is the diametrically opposed stereotype to the Goat. They would much rather get up and go do something than sit around and think about it. There is no problem that can’t be solved by doing something about it. They are so energetic that not being physically active is irritating and stressful. The negative outcome of this is that they become impatient with the sedentary Sheep. When the dog and sheep are dating, they might have a tough time understanding each other’s nature at first. But over time their love compatibility can improve with some understanding. Even in bed, the dog goat sexually might not be able to satisfy each other unless they give each other time. The Goat in turn becomes intolerant of the Dogs’ instability. On the other hand, these differences in a Dog and Sheep marriage can be put to productive use. The Dog can be off accomplishing and acquiring things while the Sheep spends crucial, peaceful alone time performing whatever art or craft is their heart’s desire. The Dog male or female may build a garden, but it is the Goat who will make it beautiful. The Chinese astrology sign Sheep may come across to the Dog as needy and lazy, but this is far from the reality. The Sheep knows precisely what it wants from a lover and companion and is more than willing to tell them so; persistently, at times. The Goat male or female is also more than willing to lavish the same sort of attention on another. But they need to tell the Sheep what it is that they want. Open lines of communication and a respect for each others’ personal time will be crucial to maintaining any kind of Dog Sheep compatibility. In the business milieu, the Dog will more than likely be the one at the front and center of things. Their no-nonsense attitude will lead others to readily trust them. They will tend to be up front about everything. If a Dog does not like someone, they will say so. If they do not believe that they can deliver on a contract, they will say so. This is usually seen as a refreshing breath of honesty and reliability in a world known for deception and lie. The Sheep does best behind the scenes. They are good at managing the utter chaos that is life. They use their lateral thinking skills to come up with creative solutions to obstinate problems. When in love, the dog and sheep soulmates can be each other’s best friends if they be just a little bit more compromising. 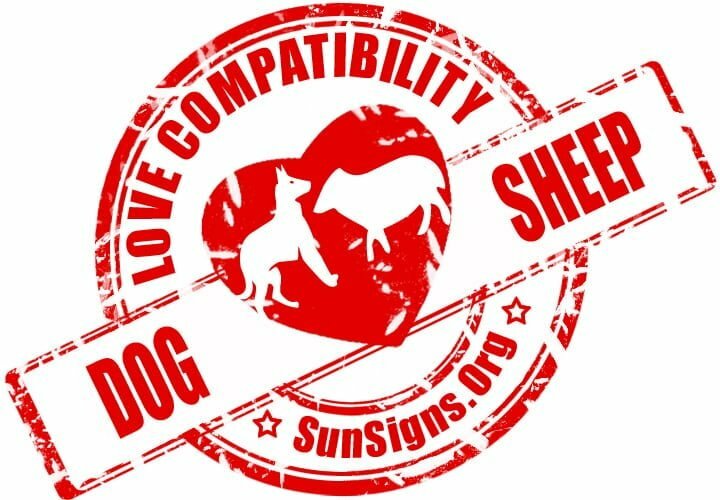 Dog & Goat Chinese Horoscope Compatibility Rated 3 Hearts!